Sanch is highly regarded for thoughtful recording productions. Caution gave way to excitement for the so-called smooth jazz performance out of St James in Trinidad and Tobago. Simeon Sandiford candidly expresses his feelings after listening to the "multi-track recordings that seemed to be completely at variance with my upbringing." Influenced by his son, a Millennial, the father says "the concept of laying down tracks, cutting and pasting music would be an entirely new, impalpable and unpalatable experience. Eventually I was brave enough to summon the courage and enthusiasm to audition an unmastered version of the final mix." But he continues, "I was so captivated by the rich blend of rhythms and melodies that I immediately suggested to Jeff that we find a way to brand Nite Life as being a group that was both Caribbean and Original. This was not Earl Klugh, George Benson, Norman Brown or Ernest Ranglin. This was Jeffrey Pattaysingh using Quintessential Caribbean Rhythms to describe the very fabric of his music. The group promptly decided to add this tag line to their name. From that point, things moved swiftly. We needed to inculcate some of the ancestral messages of our forefathers by adding more distinctive flavours of Mother Africa and Mother India to compliment the efforts of the group’s percussionists Rene Placide and Gregory Pattaysingh. I therefore invited organic drummers Ja Jah Oga Onilu and Peter Telfer to weave their magic into the fabric of some of the compositions. You will hear bongos, congas, tambourine, wood blocks, tassa, cowbell, iron, the ‘talking’ drum, conch shell, dhantal, triangle, djembe, chimes, bamboolin, thumb piano, shakers, rain stick, and Ja Jah’s newest creation the drumlan, in a vitriolic potpourri of “Caribbean - ness”. Please allow yourself to leave your Chill Zone to Come Dance With Me before Going Home from a Midnight Run. Your Heartbeat will be given a Jive Thyme as you close your Rainbow Eyes to listen to these eclectic compositions, produced for you with All My Love. We both know that since you were a Creeper you have always wanted to experience Midnight in St. James, the epicentre of rhythmicity in the Caribbean, where ”everything is gonna be all right”. I am sure you will agree that Nite Life’s rhythms are not just rhythms of Calypso, Soca, Zouk, Chutney, Reggae, Merengue or Son. They are also heavily spiced with the exotic aromas from bake and shark, curried crab and dumplings; jerk pork, doubles ‘with slight pepper’, roti, pelau, corn soup, souse, black pudding, Crix and buljol mixed with coconut water, mauby and Carib beer. 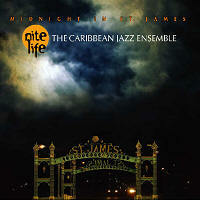 “Midnight in St. James, that’s the place I wanna be tonight”!